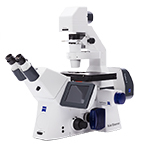 These inverted research microscopes are available fully motorized or in a modular microscope system. In life sciences research you require reproducible data from a wide range of samples in a variety of conditions, and these inverted research microscopes will do just that. You can benefit from automation and efficiency. Whether you require brightfield, phase contrast, differential interference contrast (DIC), PlasDIC, improved Hoffman Modulation Contrast (iHMC) or fluorescence, these inverted research microscopes perform. The IVF contrast system is particularly effective in IVF labs. Switch between iHMC, PlasDic, and DIC without modifying the stand.